Providers across the country look to Pioneer Network to keep them up to date about changes in regulations, advancements in person-directed care practices, and innovative staff development opportunities about culture change. 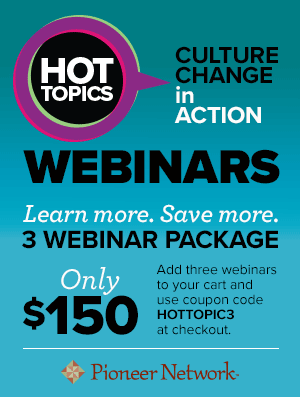 Check back here regularly for the latest listing of online and in-person continuing education such as webinars, conferences, and presentations to help you on your culture change journey. All times are EST unless otherwise indicated. Event: Person Centered Dementia Care: First Came the Recommendations, Now Let’s Explore the Outcomes! Event: It’s Happening: How Anti-Ageism Activists are Changing the Culture of Aging! Providers across the country look to Pioneer Network to keep them up to date about changes in regulations, advancements in person-directed care practices, and innovative staff development opportunities about culture change.